Organize your work top. Throw away all the trash and put your necessary things in a pencil/pen holder. I have used my pencil holders to organize my pens, pencils, sketch pens, highlighters, ruler, stick notes, stapler and glue. It’s easier to work on a clean table. 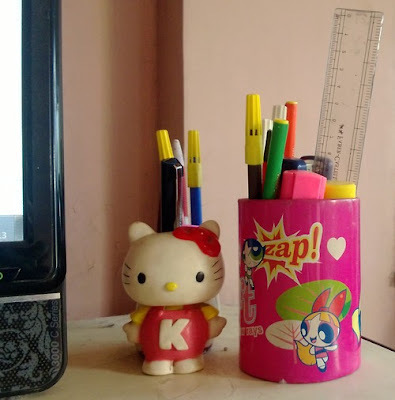 The Hello Kitty pencil holder I got as a birthday present from my school friend, Anuja. And the Powerpuff Girls pencil holder was given to me by my brother. He came home, showed me this and said, "Take this. I got for you." I was shocked! But I love these two, a lot! Do you have similar pencil holders?